Leave us your name and number and/or email and we will get back to you as soon as possible. Hewitt & Booth runners up at the Eaton Smith Business of the Year Awards! Last Friday Viv, Christian, Janet and Andrew went to represent Hewitt and Booth at the 20th Eaton Smith Business of the Year Awards held at Cedar Court Hotel, Huddersfield. As winners of the monthly award in June, we qualified for the shortlist for Business of the Year along with the other 11 winners from throughout the year. 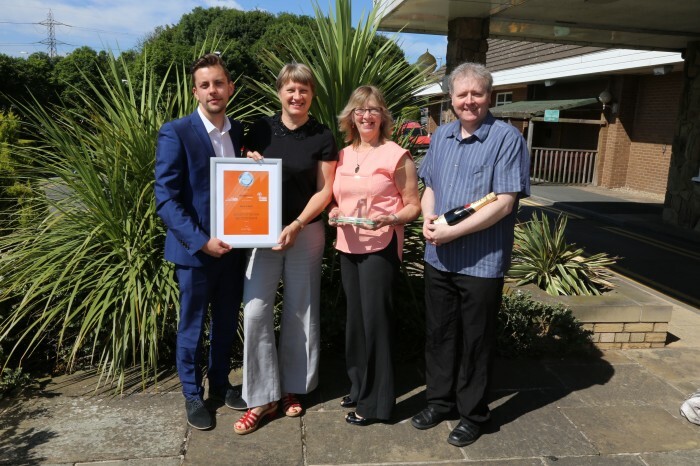 Having arrived with no real expectation of winning, we enjoyed Bucks Fizz on arrival followed by a Full-English Breakfast before the awards ceremony. Sufficiently fed and watered we awaited the announcements, preceded by a welcoming speech by Andrew Sugden, Senior Partner of Eaton Smith, who then announced the results. In third place was J G Harrison & Sons Electrical retailers and wholesalers operating from Dewsbury, Halifax, Bradford and Rochdale. Then followed Hewitt & Booth in a highly respectable second place, pipped at the post by Millennium Care Services of Featherstone, who provide support for adults with various disabilities through care homes, supported living, active living and domiciliary care. All at Hewitt & Booth are immensely proud of our achievement and it is testament to staff and all involved with the company that we should achieve this award. One particularly poignant sentiment shared on the day was that of Lloyd Simpson, MD of LSi Ltd, last year’s winners that advised us all to “use these awards to grow confidence in your business – and make sure your employees are recognised because without them, you may not be where you are today.” This was echoed by Viv Jebson, Managing Director of Hewitt & Booth in her acceptance speech where she spoke of the dedication of staff, mentioning Janet Quanne, Warehouse Manager,, as she had gone out and purchased 500 wooden spoons one weekend in order to replenish warehouse stocks. Hewitt & Booth are market leaders in the bespoke manufacturing of pipe cleaners and flexi-stems. All of our products are made here in Huddersfield, England, allowing total flexibility with quantities and specifications.